But I had a small problem with the language because I missunderstood “fry the seitan” and didn’t read the whole thing, so I deep fryed it 😉 . And it was one of the best mistakes I’ve ever made!! Mine seitan didn’t come out that way. 🙁 🙁 🙁 How do I keep the breading from coming off in the oil? Delicious recipe… I tried this in my home. I did not get the same vibrant color like above image. But the taste was good. My sisters did like this recipe. Can you tell me the other types of syrups which can be used for this recipe? I made this tonight and it was amazing! I don’t even like cornbread but this was delicious! Thanks for all the hard work and details! I love that there are more resources to go vegan and less excuses. Keep up the amazing job!! of course you could be insane however your message is owsum. 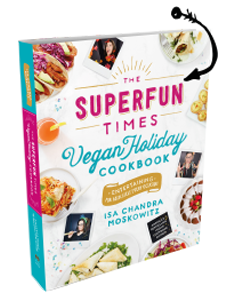 I made your chickeny seitan for the pot pie in your holiday recipe book. It is without a doubt the very best seitan I have ever make. Truly outstanding. So, now I have leftovers…tho first leftover dinner was a fajita bowl…onions, peppers and chickeny seitan over rice that was delish. Still have more and am searching for more recipes I can use it with. 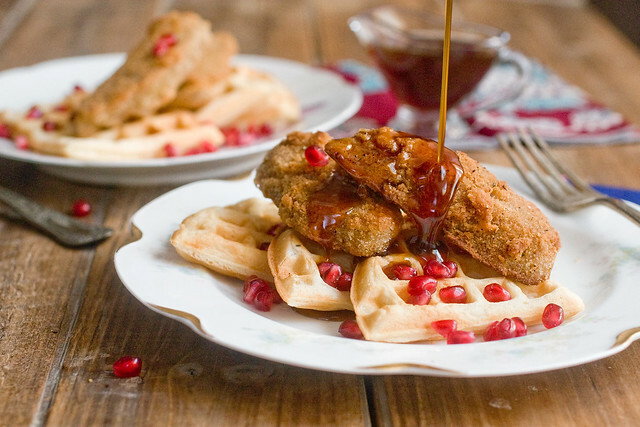 I don’t have a waffle iron but will see if there are some frozen vegan waffles at the store so I can make this one with the syrup. From the photo you can instantly understand how tasty it is going to be!